In the thrilling sequel to the naming of darmstadtium, roentgenium and copernicum, two more of the heaviest elements in the periodic table have finally been named: give a warm periodic table welcome to flerovium and livermorium! Element 114, previously known as ununquadium, has been named flerovium (Fl), after the Russian institute’s Flerov Laboratory of Nuclear Reactions founder, which similarly is named in honor of Georgiy Flerov (1913-1990), a Russian physicist. Flerov’s work and his writings to Joseph Stalin led to the development of the USSR’s atomic bomb project. The researchers got their first glimpse at flerovium after firing calcium ions at a plutonium target. Element 116, which was temporarily named ununhexium, almost ended up with the name moscovium in honor of the region (called an oblast, similar to a province or state) of Moscow, where the research labs are located. In the end, it seems the American researchers won out and the team settled on the name livermorium (Lv), after the national labs and the city of Livermore in which they are located. Livermorium was first observed in 2000, when the scientists created it by mashing together calcium and curium. Textbooks are changing before our eyes! This same lab has also synthesized elements 113, 115, 117 and 118, but those have yet to be confirmed so they won’t be named just yet. That leaves the race to elements 119 and 120, which I discussed earlier. The 8th period (row) would introduce a new block, making the whole table much wider. These blocks represent the type of the highest-energy orbitals occupied by each element’s electrons. The types of orbitals are categorized by the shapes of the areas with the highest probability of an electron being inside. Weird, I know. For example, pink elements’ most energetic electrons are in the s-orbital, which is shaped like a sphere. That means their outermost (from the nucleus), most energetic, electrons are most likely to be in that sphere (their exact paths are impossible to know due to the Heisenberg uncertainty principle). 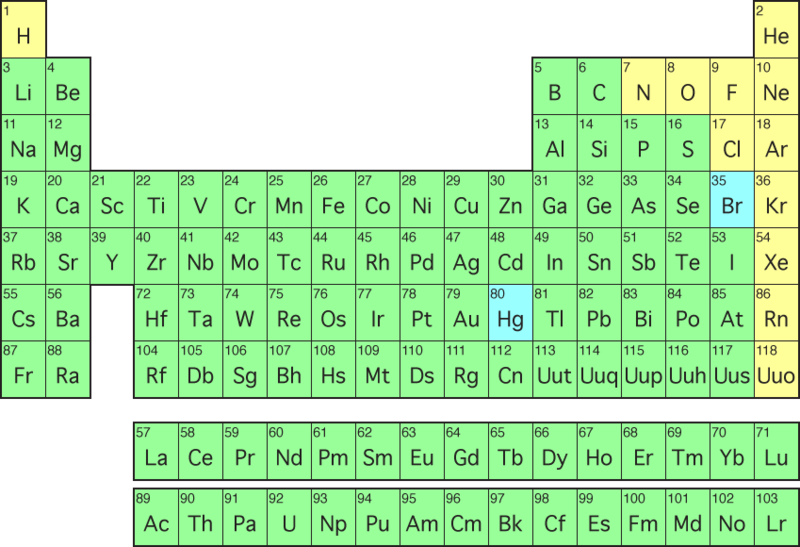 Each different colour in the periodic table above means that the outermost orbital is a particular shape, and elements over 120 are theorized to have a new orbital shape, which is why they get a new block. In this table the yellow elements are gases at room temperature (ex. hydrogen, oxygen, nitrogen, helium), the greens are solid and the blues are liquid (only mercury and bromine). Notice that block I mentioned, the f-block, at the bottom, keeping the table nice and thin, although out of order. One technicality I have to note though is that elements 71 and 103 on the right end, lutetium and lawrencium, are actually part of the d-block, not f-block, but they’re still grouped with the bottom series, called the lanthanide and actinide series. Since I’m getting into the periodic table, I might as well explain why there is a periodic table in the first place: a scientist named Dmitri Mendeleev realized that if you organized atoms by their mass, they fell into a repeating pattern in terms of chemical properties, like helium, neon and argon having similar properties, for example. With what I’ve explained above, it should be easier to understand just why: the periodic table is effectively organized by the properties of the outermost electron orbital, which is generally what interacts in chemical reactions. Every element in a particular column has the same thing going on in its outermost electron orbital, so it’ll have similar chemical reactions compared to the elements above and below it. Since you’re all up on your science news, you’ve probably heard of the idea of silicon- instead of carbon-based life, which makes sense when you see that silicon is directly below carbon in the periodic table. You may have also heard of the recent report on bacteria that possibly incorporated arsenic into their DNA instead of phosphorous (although that story should be taken with a pound of salt); arsenic is also directly below phosphorous in the table. The table is magic, is what I’m trying to tell you. In summary: flerovium and livermorium, and I’m easily distracted, but I hope you learned (or at least remembered) something!